Location: Spring Lane, Malvern Link. Description: a bronze lion head spout running into a white tiled basin and surround. Water has been piped to this site since at least the 1840s. For those of Earl Beauchamp's tenants who lived in Spring Lane it was their only source of pure water for drinking and cooking. Some had also used it for curing sore legs and eyes. People outside the area came to collect the water, because of its reputation for purity, including apparently Lord Sandys of Ombersley. At that time the prolific flow of water gushed out of a pipe, across the road, and disappeared into Link Brook. The brook flowed through Newland Court Farm and the farmer used the water in the brook for washing his hops and watering his cattle. Eventually the stream flowed down to Madresfield Court where it was used for watering the gardens and feeding the moat. The gush from the original rudimentary spout would have made the ground very boggy and access difficult, and so it was some time after in 1858 that Lord Sandys of Ombersley erected the lion's head spout and white-tiled surround and trough and had the water piped under the road. In Norman May's Guide to Malvern, c.1886, p142, it says Lord Sandys had a stone bearing his initials put over Lord Sandys Spring. This appears to have disappeared. By the early autumn of 1870 access to the spring was once again in an unstable condition and the Link ratepayers agreed to spend up to 2 pounds improving the access. Within weeks of the work there was a discussion about whether the spring was a public well at all or on private property. However, since people had been using the water for several decades and no special act of ownership had ever been exercised over it the matter dropped and the public continued to use it. The source of water comes from the field behind the retaining wall, and in that field there used to be a bottling works. The works possibly originally dated back to the 1830s because it was suggested that c.1835 the water was sold at one shilling a gallon and transported in jars long distances by coach and carrier. In the 1880s local resident John George Bennett, intended to create a water beverage bottling business and in 1886 the owners of the field behind the spout granted Mr Bennett a 44-year lease on the mineral water factory in the field. Mr Bennett Bottles - Mr Bennett did soon after avail himself of the water source and on 25th February started business. However he found that the water at the trough was discoloured and unsuitable for bottling. Thinking that the pipes were broken, one Sunday morning he had them excavated and new glazed ones laid alongside. The old pipes, which were about 40 years old, were broken and he had them taken up. The trench they dug was about 9 feet deep (2m 70cm), and stretched from the spout in a south-west direction to the corner of the field. The trench filled with about a foot (30 cm) of water. Soon both natural and aerated mineral waters were being bottled and available in jars and bottles from the three company depots at 50 St Johns, Worcester; 4 Holyrood Terrace, Great Malvern, and High Street, Ledbury. An 1886 trade directory carries extensive information about the company, claiming that the spring was the purest in the world with a history dating back 150 years. An impressive list of testimonials was also given which included remarks from Walter Tyrrell, Medical Officer of the Malvern District and Dr Hyde, Chief Medical Officer of Health for the Leigh (Malvern Link) District and others. All commented on the purity and excellence of the water. Abel Heywood in his 1896 `Malvern Illustrated' summarises that it has "a world-wide reputation for its matchless purity" and Brian Smith notes it as much publicised in the mid 19th century. Securing a suitable supply of domestic water was proving elusive to the Malvern Link Local Board which in June 1888 decided to appoint a committee to consider the necessity of a public water supply "and the practicability of acquiring the Sand [sic] Spring for that purpose". In the event the spring was not used for the main public supply and if J G Bennett had had his way the public would have been completely excluded from the water. In the first half of 1890 numerous complaints were received by the Malvern Link Local Board about Bennett's attempt to stop the public using the spring in Spring Lane, which they had been in the habit of using. "They were told that the inhabitants had had the use of the spring in question from time immemorial: it would be a serious matter to some persons if they were debarred therefrom". Under Section 64 of the Public Health Act the Board had control over all the public springs in the district, and so resolved: "That the Malvern Link Local Board protests against the notice which has been put up by Mr J G Bennett at the spring in Spring Lane, claiming the spring as private property and purporting to prohibit the public from taking the water therefrom, and hereby call upon Mr Bennett to take down such notice within a week..., and also to remove all obstructions which interfere with the use of the spring by the inhabitants of the Link for any purpose for which it has hitherto been used by them". All was not well and by May 1898 Mr Bennett had moved out of his premises on Holyrood Terrace, which had been taken over by a firm of dentists. The Malvern Pure Water Company had gone out of business and in December 1900 the creditors of J G Bennett and Co Ltd met at the Worcester Bankruptcy Offices to try to reclaim the 3,494 pounds owing to them. Mr Bennett's reasons for his financial distress dated back to 1895 when the business was organised as a public Company. The shares were not taken up and he was left working on his own. His creditors were making him personally liable for the debts, which he maintained should have been paid by the Company. By April 1901 he had moved away from Malvern Link, where for many years he had lived and worked and been an active member of the Malvern Urban District Council. Earl Beauchamp v Archer & Co - On 25th February 1901 the lease of the bottling works was granted to Charles Pratt Green, a partner in Archer & Co. They made a tank just above the trough to collect water and installed a pumping engine and suction pipe to draw the water from the tank for bottling. It still left a copious flow at the trough all year round, for the local residents. 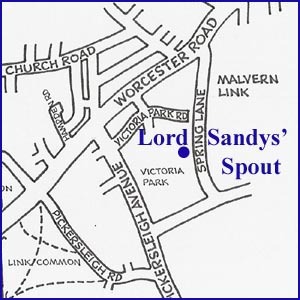 The following year the company gave Malvern Urban District Council the liberty to use the water from 'Lord Sandy's Spring' upon which they closed the factory. The right to take water from this spout was the subject of a lengthy debate in the Court of Chancery in 1903 because after 1902 Earl Beauchamp received no water from the pipe and only occasionally at the Lion's Mouth. He believed that he and his tenants had a right to the water. After much correspondence on the subject legal action commenced in February 1903 at the Court of Chancery. It was decided in court that the pipes had been laid across the field for the sole purpose of deep draining the south west corner of the field; that after exploratory holes failed to find a spring. It was an artificial stream with no natural spring to feed it; that the inhabitants had no right to the water by custom because the water was not restricted to the inhabitants of a particular district; that Earl Beauchamp had no prescriptive right (a claim based on long use), no riparian right (as owner of land bordering a river) and no claim under the doctrine of loss of grant. The water continued to be used. In the late 1920s cattle and sheep stopped to drink here as they plodded on their way to Worcester market. Rescuing the Spout - In December 1992 the site, which still belongs to the Madresfield Estate, was taken over by a local builder. 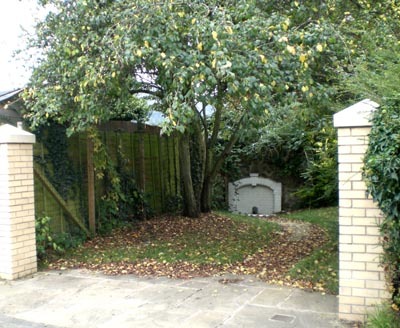 His intention was to retain the lion's head spout and basin as a garden feature for to his newly-built house. In this way further decay and neglect would be minimised but public access denied. As a result of urgent representations made by Cora Weaver and Bruce Osborne to Madresfield Estate, public access was retained. During the building works on the site in December 1992 some Codd and Hamilton bottles found carried the embossed designation "The Malvern Pure Water Company" and the trademark. Many were manufactured in Barnsley and St Helens. Bottles of this type were generally in use up to the end of the 19th century and confirm the activities of Mr Bennett. Stone beer bottles belonging to the Malvern Pure Water Company were also found. Today the spout is situated on a small plot of land opposite Malvern Aircraft and until recently was approached down a narrow path alongside a small overgrown area. Being concealed by foliage its presence was largely unknown, even by people who know the area well. A substantial 6 cu ft tank behind the spout, almost certainly the tank provided by Archer & Co, is used by the nearby Bowling Club to water the greens. The water is then piped to Townsend Farm (now Spring Lane Trading Estate). The attractive lion's head spout has been sadly neglected in the past. However in the early years of the new millennium considerable landscaping and restoration was possible as a result of a Heritage Lottery Fund grant. In 2012 development of the adjacent properties meant that the water supply to the spout was enhanced and improved drainage installed behind the spout into the brook. Founders Prize - In 2012 the prize was created for the annual well decorating and Lord Sandys' Spring was the first such site to enjoy the award. The prize was presented to St Matthias School in Malvern Link for the theme of Achievement. Modern day Well Decorating was founded in 1993 by Local Historian Cora Weaver and is now a regular May Day weekend celebration. The award is a brass plaque depicting St Werstan, founder of Malvern's first religious establishment in the 11th century and patron saint of Malvern springs and wells. The award is sponsored by Coca-Cola as part of the St Werstan Award scheme for the enhancement of Malvern's springs and wells. 1. The spout as it appears today. 3. Decorated in 2012 for the Annual Well Decorating Celebrations and Founders Award. Malvern Advertiser, 20 August and 8 October 1870. Malvern Advertiser, 6 March 1886. Malvern Advertiser, 9 June 1888. Malvern Advertiser, 7 June 1890. Malvern Advertiser, 5 July 1890. Malvern Advertiser, 15 December 1900. For details of the case see The Malvern Gazette, 13th February 1903.